Since its release in June 2016, ProZ.com Mobile –a native app developed by ProZ.com for use on mobile devices– has been widely used by freelance language professionals to browse jobs, submit job quotes, search for translated terms, participate in KudoZ, polls and forums directly from their phones and tablets. Now, as announced via ProZ.com forums, the app has been expanded to include a set of outsourcing tools and so give potential clients the option to find service providers on the go. post classic jobs with just one click. By using ProZ.com Mobile, outsourcers can significantly improve project management times by finding service providers and assigning projects –especially urgent ones– anytime, and from anywhere. For freelance translators and interpreters, ProZ.com Mobile is perfect for getting the best out of ProZ.com at any time. Language professionals get and respond to jobs offers while shopping, they participate in forum discussions at lunch breaks, and they even earn KudoZ points that will later help them to stand out in the directory by answering KudoZ questions while waiting for a bus! Also, in order to facilitate the passing of jobs not only for the agencies that use ProZ.com regularly, but also for end clients out there, new account registration and non-member login have been enabled. This is the ninth post in a series of weekly blog posts with tips to get the most out of translation industry events (click here to see a full list of previous posts). As explained in the first part, tips are grouped into “before the event”, “during the event” and “after the event” for easy reference. Please feel free to post below and share your tip(s)! Send them a nice-meeting-you email: if you did your homework during the event, you should have a few email addresses and business cards in your briefcase. Send a short email message to colleagues that have the potential of becoming business partners or clients (those who work in your expertise fields and language pairs, or those who own or work for translation companies). Let them know that it was nice meeting them and that you hope you can collaborate in the future. Make sure you are clear about the services you offer and that they may use. What’s important here is that you send them a personalized message and not a general one that you may send others as well. Add them to your social networks: search for potential clients and collaborators who attended the event in social and professional networks such as Facebook, Twitter and LinkedIn. When doing so, just make sure that your profile is a professional one or that the posts you make and that they see are related to the services you offer (most social networks allow you to set visibility and privacy permissions). Add them to your chat list: if you use chat software such as Skype, add potential clients you met as contacts. This may increase your chances of being contacted by them for rush projects or for projects for which they don’t have anyone in mind. Include their names in greetings or gift list: if once in a while you take some time to thank your clients or send them a card or a gift (for Christmas or New Year for example), make sure you include potential clients’ names in the recipient list as well. This will let them know that you keep them in mind and help them to keep your name in their mind as well. Invite them to future events you plan to attend: if there are any future events that you are planning to attend and that you believe may be of interest to these potential clients or colleagues, make sure you take a few minutes to invite them and show them that you are willing to see them again. You may invite them via email or social networks as long as your message is short and to the point. In general, keeping in touch with potential clients is easier than meeting them for the first time. So, if you managed to leave your shyness aside and make an impression during the event, you should be able to stay connected afterwards, increasing your chances of getting collaboration requests and even making new friends. In the end, and as Socrates puts it, be slow to fall into friendship; but when thou art in, continue firm and constant. How do you keep in touch with potential clients and collaborators? The next –and last– part in this series will provide you with one last tip to get the most our of industry events. Keep in touch! This is the seventh post in a series of weekly blog posts with tips to get the most out of translation industry events (click here to see a full list of previous posts). As explained in the first part, tips are grouped into “before the event”, “during the event” and “after the event” for easy reference. Please feel free to post below and share your tip(s)! Start by approaching attendees one by one, or in groups, and open conversation. Questions such as “what services do you offer?” or “do you work for end clients or mostly agencies?” may already give you an idea of whether the other attendee is a freelancer like you or a professional working for someone else (a potential client). Let the other person know the services you offer, the language pairs in which you work and your fields of expertise. Even if the other person is not a company representative, it may be a freelancer who can invite you to collaborate in future projects (or even send you projects they cannot handle). If the other person represents a company, information on services, languages and expertise is also relevant. In both cases, if the other person gets interested in what you have to offer (i.e. they ask questions, they follow-up on what you say, etc. ), make sure you don’t leave the conversation without giving them your card. In the case of sponsors, approach their sponsorship stand and familiarize yourself with their services. Some language service companies prepare application forms for conferences, others just invite you to leave them your contact details. Finally, it is good practice to do some homework before the event to learn who is attending and prepare a list of potential clients and collaborators in advance. You may even contact them before the event and make arrangements to meet in person. See tips on how to plan your event here. In the end, what matters is that you make the most out of your conference fee investment. Industry events tend to attract a good number of people and it is possible that you get a job offer from the last person you thought you would. Just make sure you are ready for the opportunity. Keep a small pile of business cards in your pocket, smile and you are all set! Have you ever met a client or a collaborator in an industry event? Stay tuned! The next part in this series will explain the importance of sharing your feedback once the event is over. This is the fifth post in a series of weekly blog posts with tips to get the most out of translation industry events (see Part one, Part two, Part three and Part four). As explained in the first part, tips are grouped into “before the event”, “during the event” and “after the event” for easy reference. Please feel free to post below and share your tip(s)! Some people are more open than others to new experiences and to meeting new people. However, most of us may inevitably experience some level of anxiety when attending an industry event. At some point, arriving at a place we have never been to before, introducing ourselves to unknown people, socializing or engaging in conversation may make us feel uncomfortable and nervous. This, in turn, may affect how we behave around others, how others see us and how we will be remembered when the event is over. Make a mental list of conversation starters: try to think of two or three topics that may interest other event attendees (rates, clients, marketing, CAT tools) and use these to open conversations and keep them going. You may start by introducing yourself and then asking the other person a question (“Hi, I’m Joe Doe. I’m from Spain. Where are you from? Do you offer your services internationally or to local clients only?”). Approach people you know: start by looking for one or two attendees that you may know (from social networks, from past events, from contacting them prior to the event, etc.) and warm up slowly, initiating small talk, asking questions, smiling. Once you feel more at ease with yourself, reach out to other attendees, join small groups, introduce yourself, ask them if they are having a good time. Avoid seating or wandering about alone: during event presentations, coffee breaks and meals, try to always seat or stand next to other attendees. But, careful! Seating next to colleagues or simply standing next to them won’t do the trick (don’t expect others to welcome you just because you are there). Talk to them, introduce yourself, smile, make eye-contact. Breath, smile and relax: most of the people in the room feel just like you and are there for the same reasons: to learn, network and have fun. So, go ahead, take a deep breath, relax your body (no arms crossed! ), put your phone in your pocket and give yourself the chance to know them and them the chance to know you. And if all of the above fails, here is the best tip of all: be yourself. Yes, you are a language professional, but you are also you. You work as a translator or as an interpreter, but you also have a personal life that others may be interested in or may identify with. Keep your personal style, let others know who you are, where you come form, what interests you. This is what attracts not only clients and colleagues, but also friends. The next part in this series will propose tips to make an impression during an industry event. Stay tuned! In general, the criteria used by translation agencies and end clients for choosing the appropriate translator or interpreter for a given job are well-known: specialization in a given language pair and field of expertise, years of experience, rate range, availability, credentials and client feedback, among others. But outsourcers are not the only ones in a position to set the parameters for a given job and working relationship. Translators and interpreters too can –and actually should– have their own set of parameters to decide when to accept a job offer made by a new client or decline it. The ProZ.com Certified PRO Network, an initiative of the ProZ.com community to provide qualified translators and translation companies with an opportunity to network and collaborate in an environment consisting entirely of screened professionals, has reached 3,000 members and more and more applications are being submitted every day. To enter the Certified PRO Network, ProZ.com members must complete an online application and submit it for review to prove they meet or exceed minimum professional standards based on the EN15038 standard for quality in translation and in three screening areas: translation ability, business reliability and online citizenship. The ProZ.com Certified PRO network is being provided as a service to ProZ.com full professional members only (non-members can still complete and submit their applications for review). If admitted, members pay no additional fees. Click here to start completing your application. 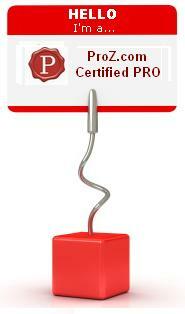 More information about the ProZ.com Certified PRO Network is available here. 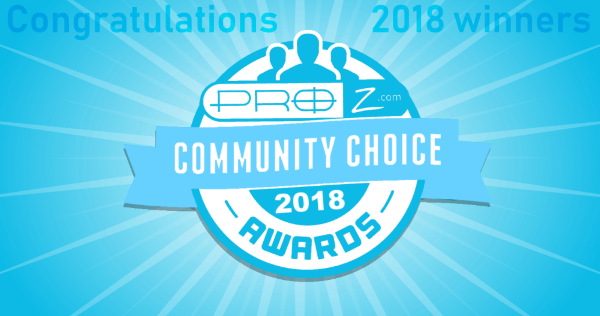 Congratulations to the over 3,000 ProZ.com members who are further differentiating themselves professionally and taking networking and collaboration to a new level! Every business type is exposed to risks influenced by numerous factors and the translation and interpretation business is no exception. Regardless of the type of activity involved, everyone either offering language services or looking for language service providers is exposed so several types of risks that should be acknowledged if a reliable and successful service provider-outsourcer relationship is desired. With this in mind, ProZ.com has been creating content and developing new tools with the purpose of helping translators, translation companies, and others in the language industry to learn about the different risks involved in doing business online and how to prevent them. One of these resources, and probably the most widely used by service providers when assessing risks, is the ProZ.com Blue Board. The Blue Board record is the complete, searchable database of records made up of feedback entries posted by language service providers in connection with outsourcers they have worked with. For service providers, the Blue Board record has proved to be a great tool for assessing the reliability of specific outsourcers before accepting a job offer from them. For outsourcers, being listed in the Blue Board record with a good number of positive entries from service providers represents a great marketing tool. Outsourcers with a good Blue Board record report a higher degree of trust and shortened project launch cycles among those service providers who reference the Blue Board. More information about using the Blue Board record is available here. For more information about the ProZ.com industry wiki, visit this page. A recently released scam alert center is another potentially valuable resource for those seeking to manage risk when it comes to false job offers and other scams. The Translator scam alert center is an area used to provide organized, concise information regarding false job offers or requests and other scams which may be aimed at or are affecting language professionals and outsourcers. Information provided in the center is based in part on reports made by ProZ.com members through the online support system and in the ProZ.com Scams forum, and ProZ.com members have the option of subscribing to receive useful news and alerts of new scams as they are detected. The scam alert center is available here. Finally, ProZ.com also offers its members a free webinar on “Risk management for translators and interpreters” on a monthly basis. This training session enumerates and explains risk management procedures that translators and interpreters should follow as part of their everyday professional activities. The schedule for these webinars is available here. Regardless of the number of years a service provider or an outsourcer has been in the translation industry, risks are everywhere when doing business. However, the above-listed resources and tools have been made available by ProZ.com to promote not just professional practices, but also clear and concise information on the steps that should be taken to avoid risks when participating in the language industry. If you have any questions about these tools and resources, or if you need assistance with using them, contact site staff through the support center.